There is something endlessly fascinating to us humans about time, memory, life and death. These are the subject matter of Don Hertzfeld’s latest animated short film. His 2012 film “It’s Such a Beautiful Day” featured a character getting lost in his own mind thinking about everything from the mundane to the existential after a serious injury causes a bizarre condition. With “World of Tomorrow” Hertzfeld has again found a way to challenge us with existential questions in his own unique surrealist animation style. 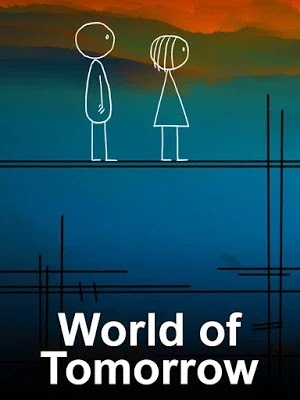 In keeping with his traditional style "World of Tomorrow" features hand drawn characters that look like the sort any child might draw at the bottom of their notebook so that flipping the pages grants a sense of movement. Yet Hertzfeld places them in simple, but rich environments that make every inch of the frame pop with color. Hertzfeld admitted in an interview with Collin Souter (writing for rogerebert.com) that the only way he could get his 4 year old niece to lend her voice for the project was to record her over the course of a few days as they drew pictures and played with toys. As such, her part was entirely unscripted, a collection of sound bytes he was able to cobble together along with Julia Pott's scripted lines to form a story. And as if by some miracle what he was able to get from her, along with the parts he scripted are often funny and deeply thought provoking. Young Emily (Winona Mae) is curious young girl who spends her days fascinated by the ever present now. Her future self (voiced by Julia Pott), like all of us as we grow older thinks in more broad terms constantly concerned with memories of the past and fear of the unknown future. She takes her younger self on a journey into the future to introduce her to these ideas of memory, love and death. They’re the sorts of things that we cannot seem to stop thinking about once we get older, but cannot seem to grasp as children. The future as presented in “World of Tomorrow” is full of time travel, time monitoring, and a method of preserving life by cloning and transfer of memory and consciousness. We see the advanced technology of the future rendered as a moving surrealist painting. Often concepts like memories or our own digital consciousnesses are depicted as glowing lights and small boxes. Her first job was monitoring robots on the moon. To keep them moving, she motivated them by teaching them to fear death which they would associate with the dark side of the moon. So they remain in constant travel in order to stay in the light. Occasionally they send depressed poems. One of which speaks about moving to stay alive but to what point and purpose they’ll never know. This is one of the concepts that hit me the hardest, because often we feel this way ourselves. We are just in a state of perpetual motion doing whatever it is we feel we must in order to survive. All the while, we can’t help pondering the meaning of it all. If death were a certainty, what memories would we cling to as we look back on our lives? It is undoubtedly with this in mind that Hertzfeld wrote and created this thought provoking little film. There is also concern about the frivolities of life. We spend a lot of time on minor things in our everyday lives that don’t matter. It is our nature to get lost in the present. Hertzfeld presents life as a thing that can stretch on well past our years. The more time we’re given the more perspective is found. Nevertheless, as she leaves her younger self with sobering news of the future and advice about thinking beyond the present, young Emily immediately goes on to continue living as in the present as she ever did. “World of Tomorrow” is what we would like to do if given the chance. If only we could go back in time to give our younger selves advice on how to live. Yet whether or not that advice is heeded is another matter entirely. Few films of feature length pack so much thought provoking material into their runtime. At 17 minutes, rewatching this will be well worth the effort to gather a few more things to chew on into the future.